The Kerala High Court has ruled in P. Sujanapal v State of Kerala & others [W.A No:1524 of 2014] that except in exceptional circumstances, a judicial officer is protected from legal action of whatever nature for wrong orders rendered by him. A private complaint was filed against the writ petitioner alleging offences punishable under Ss.466, 469, 471 and 500 IPC before the Chief Judicial Magistrate, Ernakulam. The CJM forwarded the complainant for investigation under S.156(3) Cr.P.C. A crime was registered against the writ petitioner and he was arrested and produced before the Chief Judicial Magistrate. The CJM remanded the writ petitioner to judicial custody. Thereafter, final report was laid in the Chief Judicial Magistrate’s Court and the Court took cognizance on the basis of the final report. However, the High Court quashed the entire proceedings under S.482 Cr.P.C. Subsequently in a complaint preferred by the petitioner, the State Human rights commission awarded compensation of Rs 50,000/- towards the wrongful custody of the petitioner to be realised from the police officer who had taken him into custody. Thereupon, the writ petition was filed seeking compensation of Rs.10 lakhs on the plea that the CJM had, through his acts, failed to exercise his due judicial powers and duty and this has resulted in infringement of valuable rights of the writ petitioner under Article 21 of the Constitution of India and hence he is eligible for the compensation claimed. The single Judge granted him a further compensation of 25,000/. Petitioner approached the division bench by way of Writ Appeal, contending that compensation paid to him was very low and further demanded disciplinary action be taken against judicial officer who remanded him to custody. 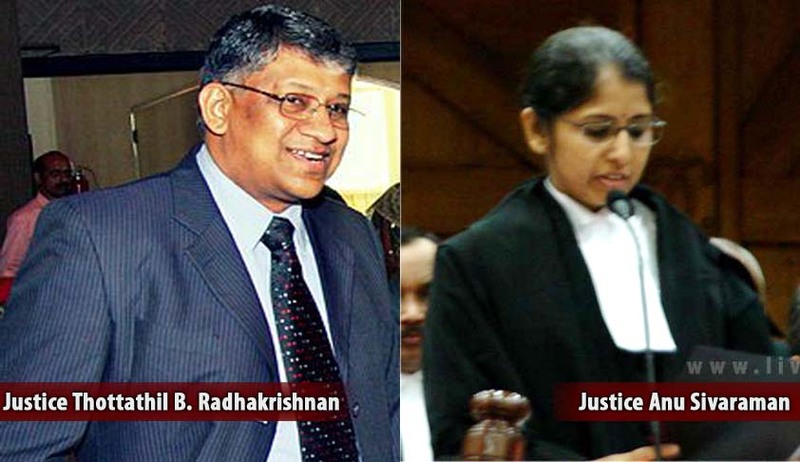 Dismissing the Writ Appeal, a bench comprising of Mr Justice Thottathil.B.Radhakrishnan and Mrs Justice Anu Sivaraman held that even under circumstances, where a Judicial officer may pass erroneous orders ,in the absence of misuse of such judicial power for personal gains or where the erroneous use of judicial power is shown to be dishonest or mala fide, such an officer is completely immune from consequences ensuing from such orders. It was observed as follows “A Judge may be liable to be proceeded against for a wrongful act done by him while acting in his personal capacity. He may also become liable to be proceeded against if he misuses his judicial power for personal gains or where the erroneous use of judicial power is shown to be dishonest or mala fide. Except in these exceptional circumstances, a judicial officer is protected from legal action of whatever nature for wrong orders rendered by him. Thus, when a judicial officer is acting judicially, even if he commits an error and passes an erroneous order, he would be protected from legal action”. Having laid down the law , the bench went on to add on the following as a note of caution and supplement of its legal reasoning:-“Otherwise, the consequence of every order reversed in appeal could be an action against the author of the original order for damages, which cannot be conducive to public good and indeed to the rule of law. The maintenance of the independence of the judiciary being a larger public interest which overrides the public law rights of individual citizens, an action for compensation against a judicial officer for the issuance of an erroneous order is also opposed to public interest. The judicial officer would also be protected from any judicial proceeding in a case like the present one”. In the absence of any malice or misuse of power by the Judicial officer, the court held that petitioner is not entitled to any compensation as sought for, and the order granting him compensation by the single bench would stand vacated. The Court however limited the compensation for ‘wrongful detention’ as granted by the State Human Rights Commission.